Situated in the idyllic location of Church Stowe just west of Northampton. A little hamlet off the A5, one mile south of Weedon (near to where the A45 & A5 cross). It is also just 6 minutes from junction 16 of the M1 motorway: OR 5 miles north of Towcester on the A5. A private area with lots of easy parking. Before you turn, look up the right hand lane and locate a village entry sign, (white and black) it says Stowe Nine Churches, Church Stowe, about 40 metres from where you are. Turn right and drive up to that sign. Opposite that sign is an open 5 bar gate (and a sign “The Manor”). Go in the gate & up this track – East Barn is the third drive on the left. 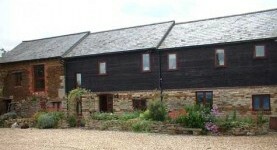 The barn lays back, with plenty of its own parking.